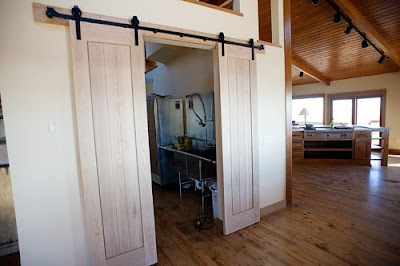 I have a thing for sliding barn doors used inside the home. Maybe its the tall ceilings they need or just the rustic feel they bring to a room, but either way they certainly are pretty to look at. So pretty. Maybe oneday I will have a home with super high ceilings and an antique pair of barn doors. I'm putting it on the list of "would like to have"
What do you have on your list of "would like to have" for your future home? I have a friend who has an old barn door very similar to the one in the first photo that she recently installed to separate her dining area from her entry. It's verycool. I'm drawn to that last photo for so many reasons - the more modern take on the barn door, the fun front door color and the stairs. I have so many things on my "would like to have" for my future house I've lost track. But top on my list would be a crisp white kitchen and old wide plank flooring. Fun to dream on this dreary day. Thanks! I have a major thing for inside out barn doors. Would LOVE to incorporate that into a home someday, like a personal office space off a family room. I really love barn doors and their rustic qualities. Wouldn't they be great for a laundry room? Large great room with lots of windows and French doors spilling off into a garden for entertaining... in Hawaii perhaps. Still dreaming! 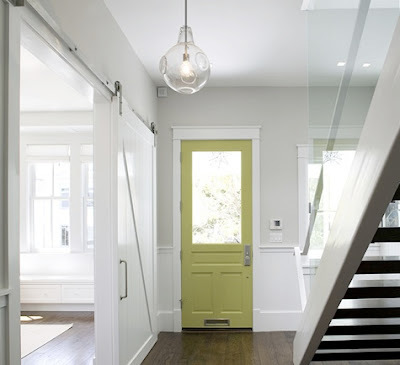 I've been drooling over those doors for eons! It's amazing how easily something can capture your eye in a mag and then become an obsession! Our door to our laundry room is not a standard size. Every sliding door we've had there has broken, so we are seriously considering working something similar in this go-round. Fingers crossed! 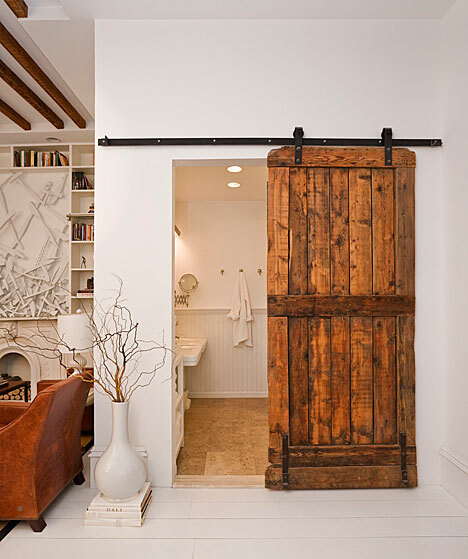 Love that white barn door leading to the bathroom! This is something I can see having in a summer home. For some reason I don't envision it in my everyday home. But what I definitely want in my everyday home is a white kitchen with marble counters. 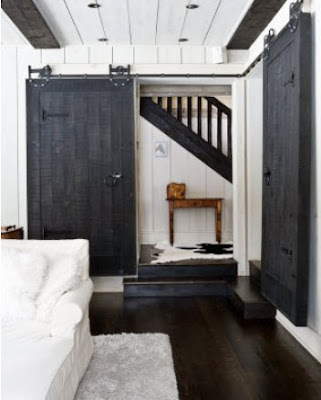 love, love, love the barn doors! my "to have" home list is so big. i would love for beautiful barn board floors finished off with a dark stain. barn doors and fundraisers for spunky 6 year olds sound good to me too. I love the barn doors! On my list would definitely be exposed brick walls. I love them! I had a barn door in my last house and it's one of the things I miss most! These are amazing! I of course would love a set of these doors in my home. The black ones are so striking in the white room. Never would have thought of painting them a darker color. My home needs higher ceilings though! I love the sliding barn doors so much. I already wish we had a space to add one in the home we already live in right now. Add it ti the list, right? me too. i LOVE that last photo and will be adding it to my inspiration folder! Can't wait to catch up on your blog. Let's get together soon. My list of "would like to have" grows all the time. Barns doors are definitely on there, along with antique Louis chairs, an upholstered headboard, and lots and lots of bookcases. Those doors are gorgeous. I love the first one that leads to the bathroom. For me I'm so far from my future 'home' but I would have to say many large windows! Linds, this is my dream, to have these in my next home. How can I make this happen....? The barn doors are definitely a nice crisp look in contrast to the white paint everywhere. Some bold wide plank floors would tie in nicely. I'll have to consider that option for some projects.